This book explores the complexities of investigating minorities, majorities, boundaries and borders, and the experiences of researchers who choose to work in these spaces. It engages with issues of ethics, disclosure and representation, and contends with and seeks to contribute to emerging debates around power and the positioning of researchers and participants. Chapters examine epistemologies that shape researchers’ beliefs about the forms of research that are valued in educational research and theory, and consider the importance of research that genuinely seeks to explore voice, culture, story, authenticity and identity. Resisting the backdrop of standardisation, performativity and accountability agendas pervading governments and organisations, the book attends to the stories of real people, to understand regional and rural landscapes, to examine culture and the human condition and to give voice to those at the fringes of society who remain largely neglected and unheard. Drawing largely on studies from Australia, the book provides an overview of the many types of research being engaged in, revealing the value of different kinds of research, and gaining insight into how meaning and findings are disseminated in research and educational sectors and back into the contexts where research takes place. 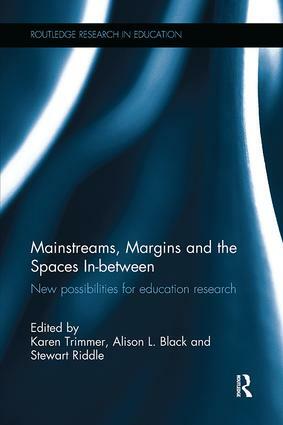 Mainstreams, Margins and the Spaces In-between will be of key interest to early career researchers and academics internationally, as well as postgraduate students completing research methods courses in the field of education, and the wider social sciences.